This event is password-protected. Register with the password above to attend this event. 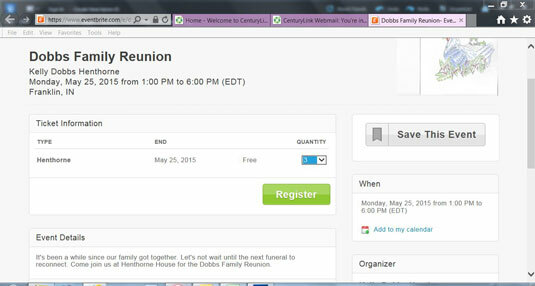 Of course, your family reunion would be password protected! Can you imagine if a Hatfield showed up at a McCoy family reunion; chaos would ensue. 1Click the Attend Event button. You are taken immediately to the event’s ticket page. 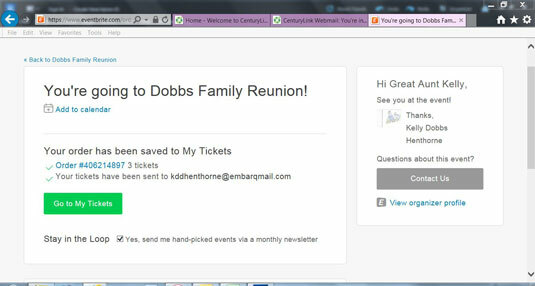 In this case, the Dobbs Family Reunion page. For a brief moment, you will see the URL for the Eventbrite page. If the link doesn’t work, you can copy and paste the URL into your browser. You can see that the tickets are free. Eventbrite offers free event planning and management services for events that don’t charge for tickets. 2Select the number of tickets you would like (number of people for whom you are reserving a space). You also have the options of saving the event and adding it to your calendar. If you click the Save This Event banner, a pop-up dialog box lets you know that you can log in or sign up for Eventbrite to save the event to your Eventbrite account. If you don’t have an Eventbrite account, are looking for something fun to do this weekend, or think you’ll be planning your own event soon, go ahead and sign up. After you click the Register button, you have eight minutes to fill in the information fields, which are asking for your last name in this case (it’s possible that the organizer already has supplied that information) and a confirming email address. 4Click the Complete Registration button. You immediately see a confirmation that you have successfully registered for the event. And, the event’s organizer receives an email notification that you are attending the event.